In June of 1667, Dutch Admiral de Ruyter commanded the Dutch fleet to carry out a devastating raid on the English fleet as they were lying at anchor at Chatham in the Thames estuary. At the time, Britons referred to Holland as “that undigested vomit of the sea”. Moreover, an official propagandist wrote a pamphlet in which he linked the word ‘belgia‘ to ‘belregia’, Beelzebub’s realm. When he used ‘Belgia’ the author actually meant... the Dutch Republic. What's in a name? 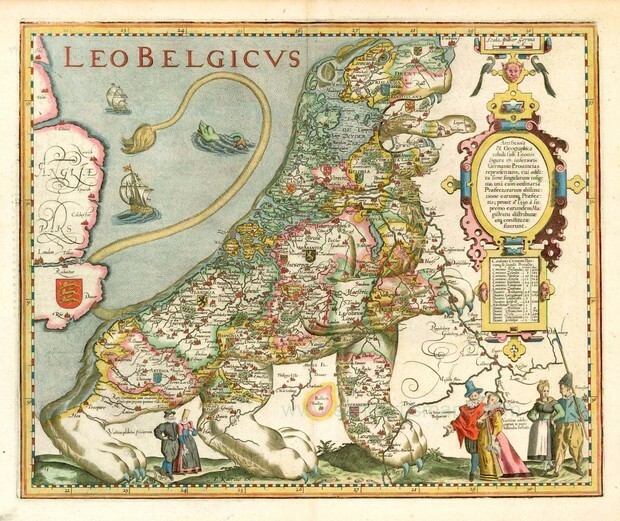 And we haven't even begun to talk about the ‘Leo Belgicus’, a lion that – both standing up and lying down – has been dominating the Low Countries’ cartography from the end of the sixteenth century onwards up until the eighteenth century, even though the Southern Netherlands had long since separated from the Northern Netherlands. The lion roars, standing upright and facing the east (his back serving as the coast line), or laying down facing south, i.e. towards France and Spain. The latter makes more sense, as the enemy did not come from the east, but rather from that wretched south. The Dutch went to work on that vomit, systematically and stubbornly: “...their tireless hands manufactured this land, / drained it and trained it and planed it and planned” (excerpt from James Brockway’s poem ‘God Made the World but the Dutch Made Holland’). As God's own subcontractors they gradually became experts at ‘living apart together’ with the sea. They will definitely need those skills over the course of this century. The Flemings eventually ended up in another kingdom which was named… Belgium. Are you still with me? He was referring to ‘les Flamingants’ (supporters of the Flemish Movement). For many French speakers that label signifies nothing more or less than extremist Flemings. Flemings, on the other hand, often regard it as a badge of honour, a label they wear with pride as it refers to being a conscious language and culture activist. “Don’t look for the meaning, look for the use” of words and terms, Wittgenstein once said. The Low Countries are located where the Latin and Germanic worlds meet.